Demonstrators gather Thursday outside the Supreme Court, demanding that the Senate reject Judge Brett Kavanaugh's nomination. Protesters unfurl a sign reading, "We believe all survivors," as they occupy the Hart Senate Office Building Thursday during a rally against Kavanaugh. Senate staffers watch from the upper-floor offices as demonstrators below them protest Kavanaugh. 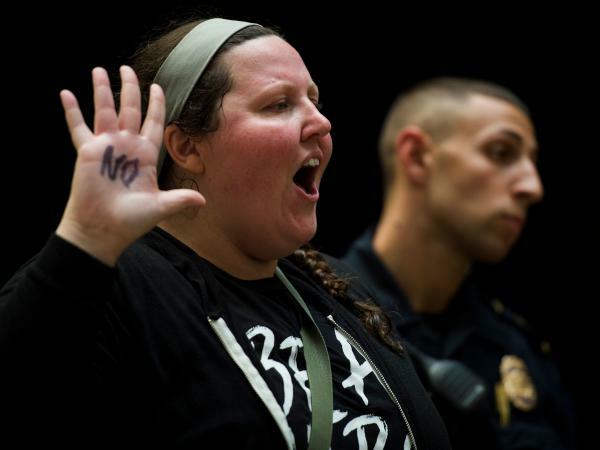 A demonstrator raises her hand, on which the word "no" is scrawled in black. She was one of many demonstrators clad in black who packed the Hart building Thursday in protest of Kavanaugh's nomination. 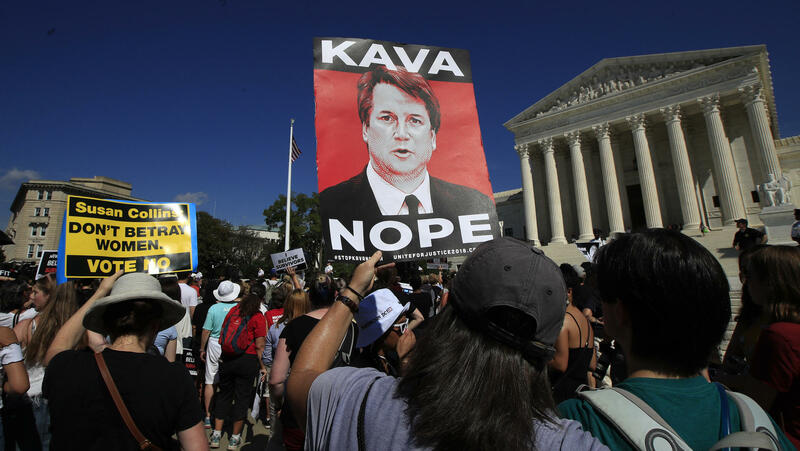 The throng of protesters gathered in the early afternoon outside the E. Barrett Prettyman United States Courthouse — where Kavanaugh serves as a federal appellate court judge — and then marched to the steps of the Supreme Court building less than a mile away. All the while they carried signs and shouted slogans rejecting President Trump's nominee, who has been the subject of several sexual misconduct allegations in recent weeks. 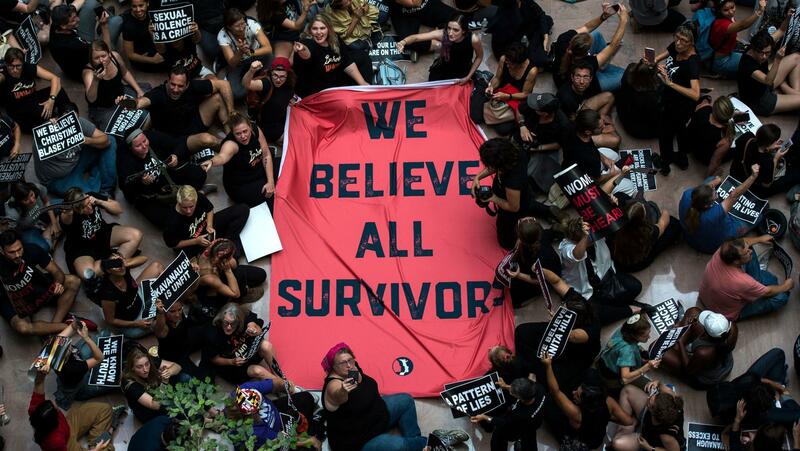 There, on the steps of the Supreme Court, a series of speakers drove home their central theme: "We believe survivors." The U.S. Capitol Police said 302 people were charged with demonstrating unlawfully in two Senate office buildings. The protest comes precisely a week after Kavanaugh and one of his accusers, Christine Blasey Ford, delivered dueling testimonies to the Senate Judiciary Committee. Ford alleges that Kavanaugh sexually assaulted her while the two were in high school in the 1980s. Kavanaugh, for his part, flatly denies the allegation, and he has the backing of Trump and dozens of GOP senators. The protest also comes the same day that senators reviewed the FBI inquiry into the accusation, an inquiry that Democrats have rejected as too limited. Sen. Bob Menendez of New Jersey had some particularly harsh words for it — including one we can't use here. 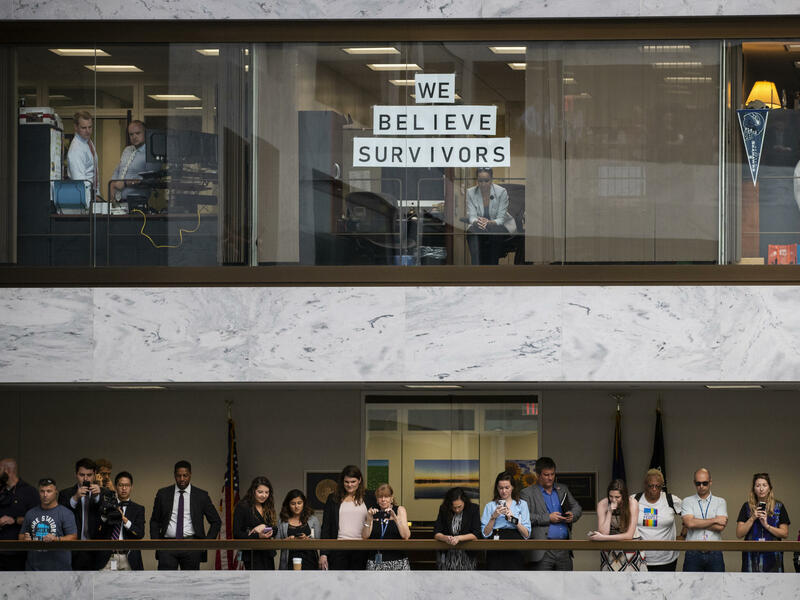 As this political drama unfolded among senators, the protesters made their way into the Hart Senate Office Building's atrium. "Hey, hey, ho, ho — Kavanaugh has got to go," the black-clad demonstrators shouted in the cavernous central area, circled by police officers. Those officers eventually detained a number of those protesters and led them out of the building, while some Senate staffers watched from the hallways above them. Others gathered in the offices of Republican Sens. Lisa Murkowski and Susan Collins, whose votes are likely to be decisive when it comes to Kavanaugh's future. The moderate senators are two of just a handful of politicians who have not yet announced whether they will be voting for or against his confirmation. Sarra Khlifi of Anchorage, Alaska, was among the protesters who made the trek to D.C. to lobby Murkowski, her state's senior senator. Khlifi told Alaska Public Media's Liz Ruskin that she took the American Civil Liberties Union up on its offer to fly women to the nation's capital. Several others joined Khlifi on her trip. "We had this unspoken understanding of, like, 'this week has been terrible,' " she told Ruskin. "So when the opportunity came up to do something about it and come talk to Sen. Murkowski, I didn't hesitate."